It’s always fun this time of year to watch all the Thanksgiving shows and read the magazines and ogle at all the lovely decorations that publishers set up probably back in July while sweating their you-know-whats off. It definitely gives people the sense – the feeling – that something special is in the air. And if a show or a magazine actually inspires someone to recreate the look, or the dish, or the decoration, then they’ve done their job. And each year it seems like there is some fad or idea that weaves its way through our nation. Some of those things have stuck around (surprisingly, I can’t believe people are still deep frying whole turkeys), and some thankfully fade (no MSG-injected birds, please). This year, it seems the stuffed turkey breast roulade is the thing to make. I did this a couple of years ago for a Friendsgiving, and it was beautiful once cooked, sliced, and plated. If you are one of those people that can’t look into the cavity of a turkey without gagging, let alone stick your arm up in that thing, then the roulade is for you. Compared to a whole 16 pounder, the roulade takes much less time to cook, and with the right amount of butter, seasoning, and herbs, it still makes the house smell delicious. Even with all that being said, it’s still not my favorite way to cook turkey. My parents used to joke when I was little that I needed a divided cafeteria tray for my Thanksgiving meal. Sometimes, I would have three plates in front of me – my dinner plate, salad/relish plate, and a bread plate – all because I didn’t like my food to touch. Can you believe that? Me. With Thanksgiving food OCD. The gravy could not and would not touch anything but the mashed potatoes. And putting veggies even close to the turkey? Ludicrous. I would eat the cranberry sauce last (I still do that), and would always take more stuffing then I could finish. When it comes to stuffing and roulading a turkey breast, it’s fun and all, but too much Thanksgiving food touching. To balance my vulnerability here, I’ll provide a little bit of fairness to this strange squabble (and mind you, this is a blog, so there really isn’t an argument unless you call this arguing with myself, in which case there are some other issues at hand besides food touching). People love white meat, especially turkey white meat. Now, these people may change their mind once they try one of those big ol’ turkey legs from a cart at Disneyland, but I digress. The thing with turkey breast is that they are bland, especially without a bone. Thus, all the fuss around the stuffing, and the butter, herbs and spices – sometimes possibly a brine – that are needed to make a Thanksgiving turkey a tasty treat. So for this part of the Turkey Day Trials, I thought about what could keep a turkey breast tasty, after the cooking, without stuffing it. Whether you are a bone-in or boneless fan, stuffed or plain Jane, something just had to work for all stages and styles of turkey breast to make it the easiest to cook yet tastiest to eat. Then, the Sage Butter Broth was born. 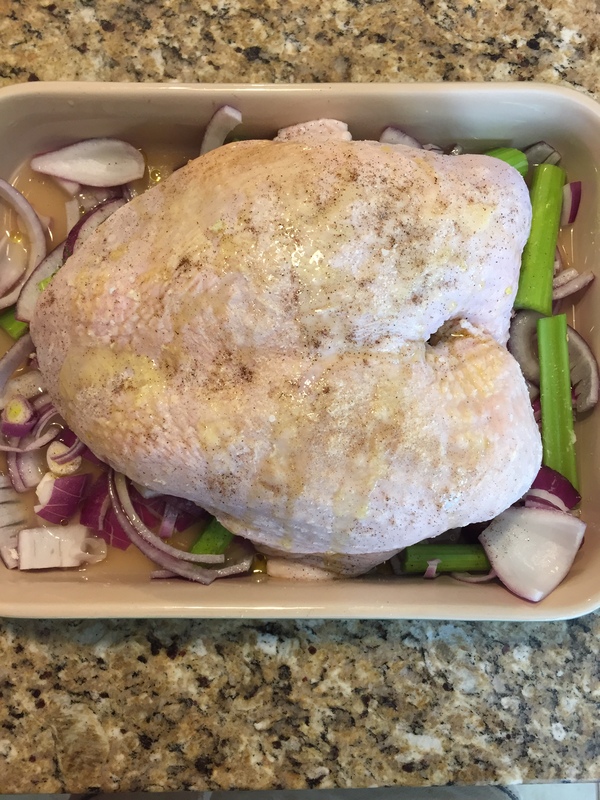 I’ve used the trick of pouring a bit of chicken broth over cooked turkey to help it keep moist. But what about all of the flavor that everyone loves on the outside (or inside, if stuffed) of the bird? With that in mind, I made a butter broth. Yes, you read that correctly. Butter. Broth. And you heard it here first, folks. 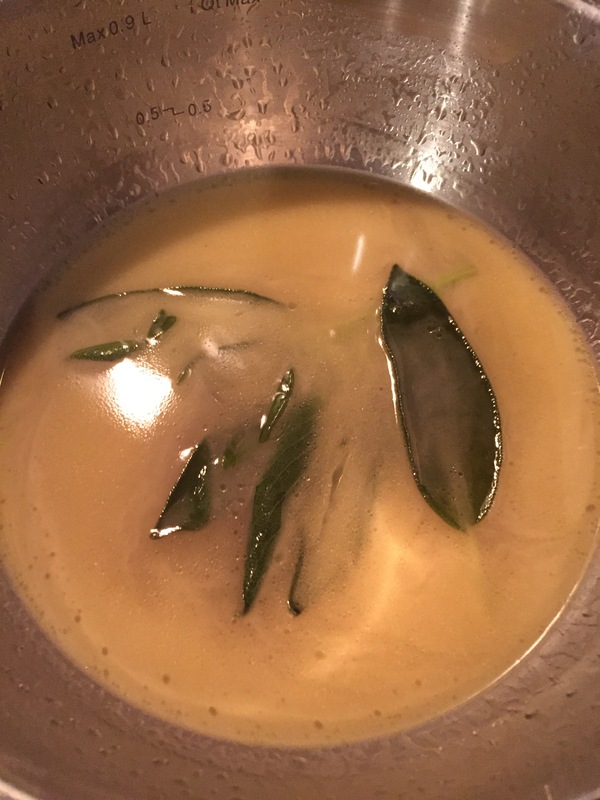 I made the Sage Butter Broth by whisking 1 cup of low sodium chicken broth, a good 1/2 tsp of sea salt, a large sprig of sage and ½ a stick of unsalted butter together over medium-low heat in a sauce pan. After the mixture had emulsified into one and was fragrant with sage, I poured it over the cooked (and rested) sliced turkey breast. So now, it’s decided that the Sage Butter Broth will be on the ever-so-most-important back burner this Thanksgiving. Making all the meat herby and buttery and juicy and delicious! Oh, you all are so, so lucky. The hubs cooks again! Maybe my Turkey Day Trials have started to rub off on people because Rob has created another fantastic addition to our Thanksgiving table: Grilled Acorn Squash (I asked him if he would want to write a blurb, but he politely declined, so I’ll do my best to recreate his masterpiece). For all you grillers out there, he halved an acorn squash then seasoned it with olive oil and s&p. He cooked it flesh-side down first (about 10 minutes), then flipped it, all on indirect heat (he says that detail is important). After about 20 more minutes, the squash was tender and ready for a make-shift glaze of butter, brown sugar, bourbon, maple syrup, and lemon juice. After glazing the flesh of the squash, he left it to caramelize for about 5 more minutes, then cut it into fourths and plated it. 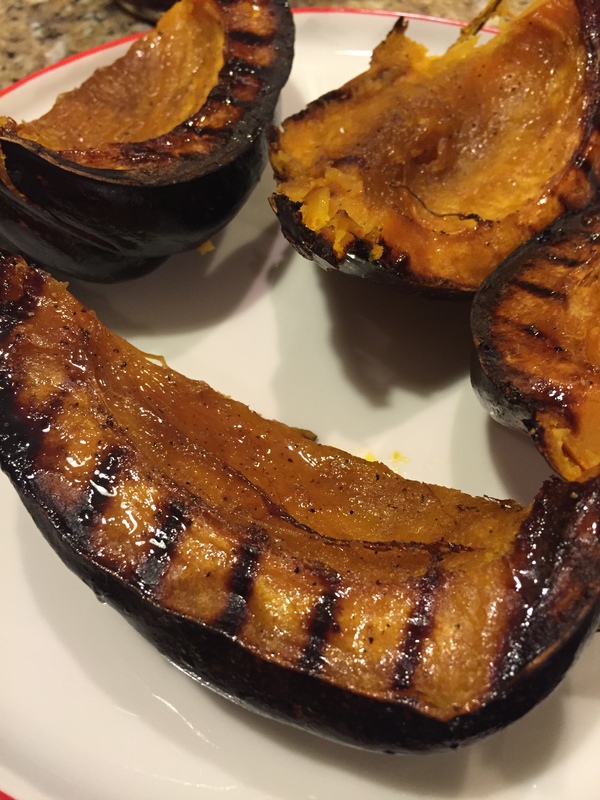 These grilled squash are legit. They are not-your-standard-pilgrim-yeah-Squanto-only-wishes-he-thought-of-this DELICIOUS. Enjoy! “I do, I do…mmmmmmmmm.” I cringe as 18 surprisingly-loud-considering-their-size 5-year old voices shout at me. Then right on cue: “Mmmmmmmmmmm,” 18 surprisingly-loud-considering-their-size 5-year old voices continue to shout at me all with hands up in the air. That last one I could relate to perfectly, and almost started sobbing myself out of sympathy and understanding. However, I’m happy to report that after five weeks into the school year, we are raising our hands to answer questions, and continuing to learn – together. Having spent hours upon hours of advanced collegiate learning about writing, expression, and both written and verbal communication, as well as hours upon hours of putting those skills to use, the hands raising situation is a perfect example of how the lack of such a small detail can simply mess up everything. I think it happens quite often when the inside thought doesn’t match the outside output. Which, in turn, always creates a learning experience. For Laura, she learned what a simple syrup is, and to only put in a recipe specifically what is on the ingredient list. I learned that if I’m going to use a cooking phrase, I might want to explain it as well. Friday night’s meal reminded me of Laura, as she was adamant about telling me how she hated squash – that was until she had a spaghetti squash salad at my house. 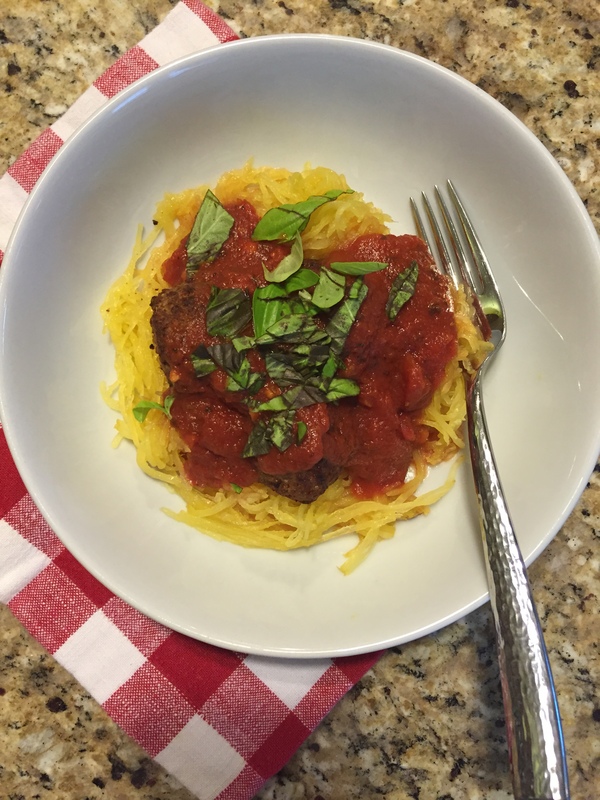 Prior to the meal, I was standing in line at the grocery store, and a woman asked me about the spaghetti squash I was buying and how to cook it. I explained the “oh it’s simple” way of cooking it flesh-side down to steam it up before turning it over to roast, and received a blank stare. The woman did not know what the flesh of the squash was. A necessary key detail! So for Laura, for the lady at the store, and for all the times I’ve tried to explain something that was oh-so-obvious in (only) my brain, here’s my simplest, easiest, go-to, gluten-free, veggie-loaded meal that will leave even the worst cook feeling proud and satisfied: Roasted Spaghetti Squash. It’s perfect for this beautiful start to the autumnal season, and smells so yummy while cooking. Roasting is high-heat cooking, usually in an oven. 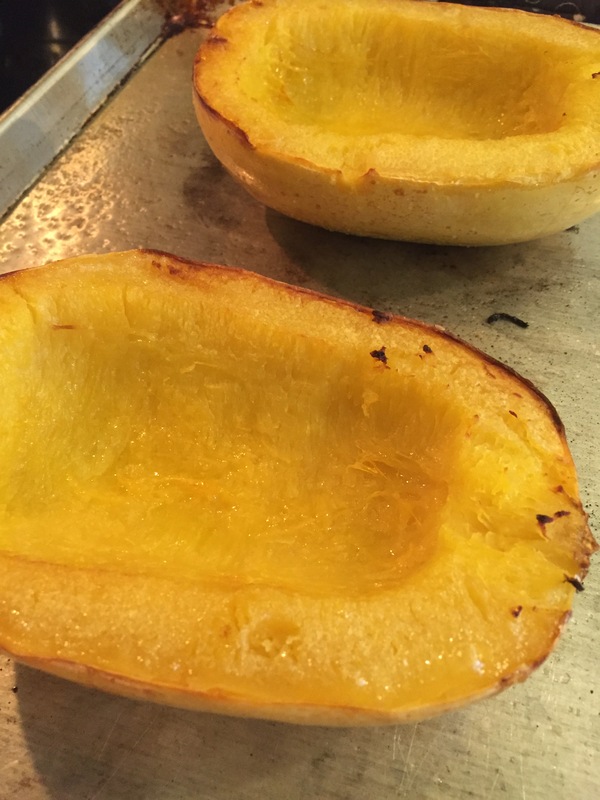 To roast a spaghetti squash, first preheat the oven to 425 degrees, and then prep the squash by cutting it in half vertically. A strong knife, like a 6-8 inch chef’s knife will work best. The inside will have seeds and pulp like a pumpkin. Using a spoon, scrape out the seeds and pulp and discard. The inside of the squash is the flesh, beautiful and yellow, and season the flesh with 2 tbsp of olive oil and ½ tsp of salt for each side. Place the squash halves open side down on a baking sheet, and roast in the oven for 15 minutes. Then, using kitchen tongs, turn over the squash halves so the open side is facing up. Continue to roast the squash for about 20-25 minutes, or until the flesh of the squash is tender enough to be pricked easily with a fork. Remove from the oven and let cool until able to handle. Then, holding the squash with one hand and a fork in the other, scrape the spaghetti squash starting at the top and pulling the fork down. The flesh will pull off in a noodle-like form, and voila! 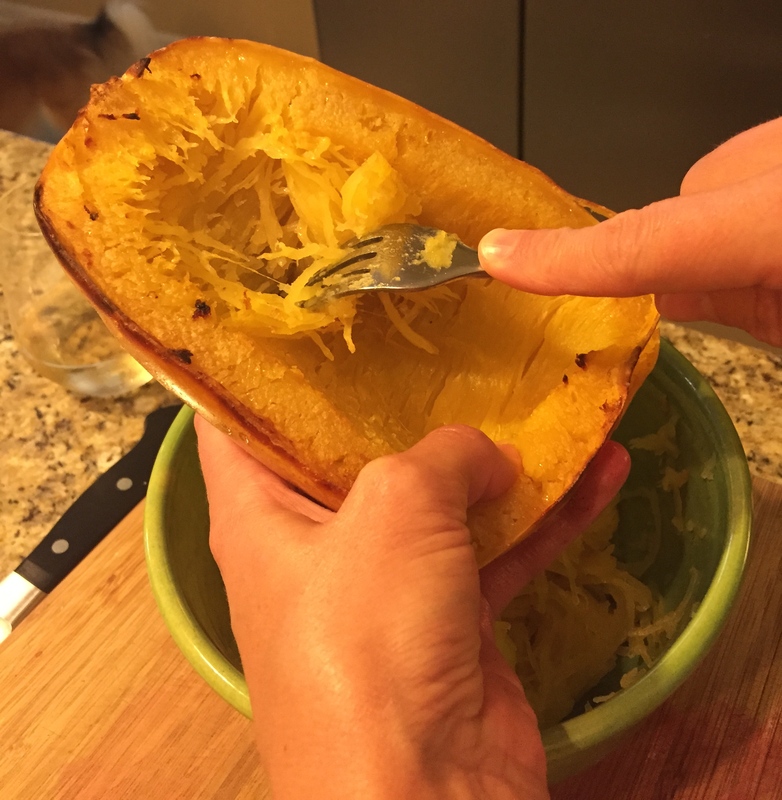 Roasted Spaghetti Squash! * melt a stick of butter, whisk in lemon juice from one lemon, and add thyme leaves in a pan and pour over the squash for an easy side dish. * shave fresh parmesan and crack fresh pepper over the squash and mix with arugula, basil, and dried cranberries for a tasty salad. * mix with a favorite tomato sauce for a faux-spaghetti dish. * add it to a turkey sandwich for a sweet, Thanksgiving-y taste. * stir into a favorite curry sauce and serve over cooked lentils for an exotic meal. 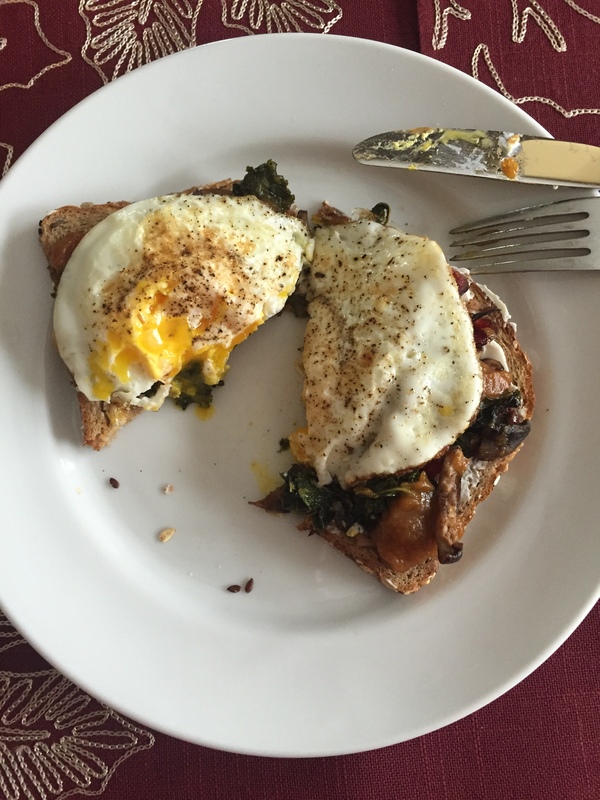 * mix in some crunchy bacon, fry up an egg to top, and enjoy a healthy carbonara alternative. 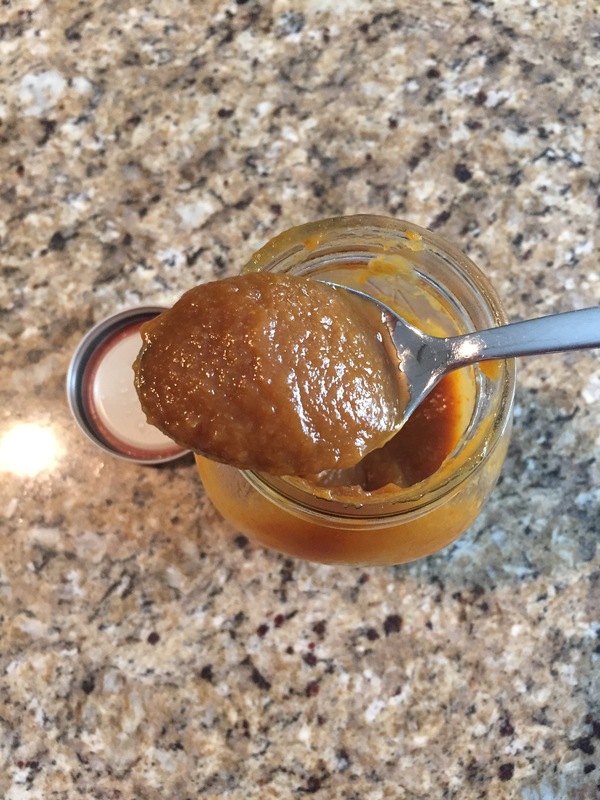 For my, eh-em, many readers out there that will inevitably make Laura famous, I have taken these cooking lessons to heart, and have started to learn how to talk about cooking more specifically. After all, the last thing we need is any more kitchen mishaps when cooking can be so much fun and so rewarding. So please, try the squash, and let me know how it turned out!